Bamboos never look their best in winter because the cold, drying winds will often scorch their leaves. In late spring however, new canes will appear bearing a fresh batch of lush foliage. 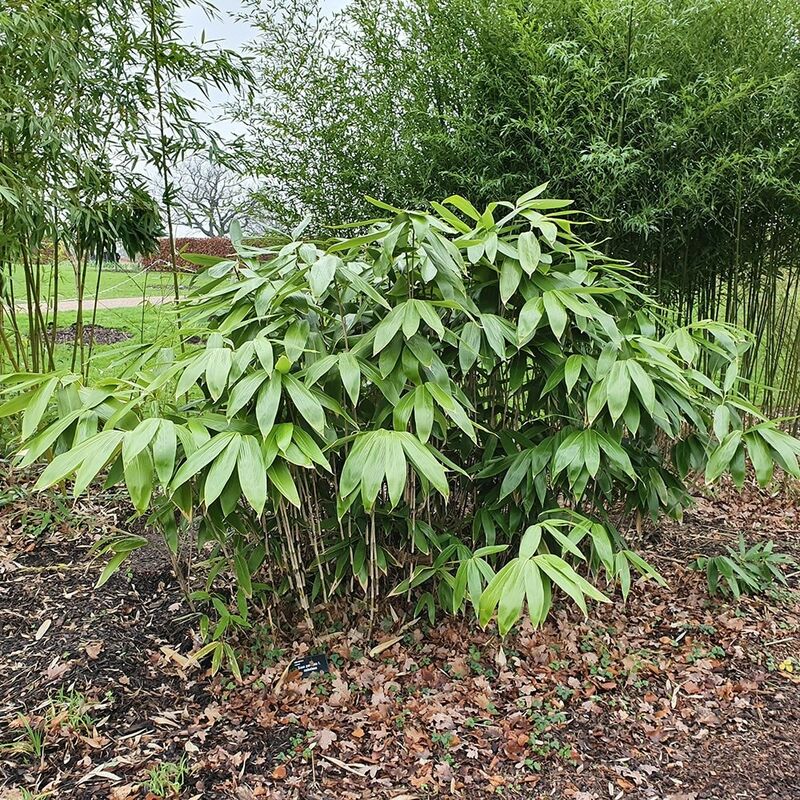 A vigorous medium-sized bamboo with green canes and mid-green leaves. The leaves tend to die back from their edges and tips during the winter, but it is quickly replaced with lush green foliage in late spring. This robust bamboo is best used as groundcover and for clipping into low moulds. It should only be introduced if you are prepared to keep it under control, since it can be extremely invasive and hard to eradicate once established. Garden care: Plant in a large container or surround the roots with a non-perishable barrier that restricts the plant's spread. Hello, how many plants come in a 2 litre pot? And how far apart from each other should I plant them? I have an area that is about 2 metres long by 1/2 metre wide within which to plant them - it is a small border. When would be the best time to plant this? Hello there As a general rule fully hardy plants that are grown in containers can be planted at any time of year as long as the soil isn't frozen solid. The best times are in the autumn when the soil is still warm enough to encourage root growth but the plant isn't in active growth, or the spring before the temperatures start to rise. We are meant to be having a cold snap soon so I would hold off planting into the garden now, but this plant is fully hardy so you can keep it outside in a place where it won't be blown over until you can plant. Hope this helps. I am considering purchasing sasa palmata which I understand is fast growing and fairly invasive. Would something like a PVC membrane cut from floor covering be sufficient to stop the plant spreading or are the runners strong enough to penetrate this material? Are Bamboos ok for a windy roof garden I notice you have some Bamboo plants in your sale. I heard some time ago that one species of this plant was one of the fastest growing. My excitement was dampened when I also heard that it was not wind tolerant. I have a roof garden in London that is exposed to the full force of the wind and am looking for fast growing plants that I can place all around the perimeter to act as a wind break. They must, of course, thrive in the wind. Have you any ideas and are any of the bamboo plants in your sale, suitable for this purpose? Many thanks.